The Buffet R13 Bb Clarinet with Silver Plated Keys is crafted from carefully selected stained grenadilla wood. The R13 Clarinet features undercut toneholes, power-forged keywork preplated in copper and finished in silver plate, 17 keys and 6 rings, hand-burnished polycylindrical bore, silver-plated adjustable thumb rest, double fish skin pads.Throughout its long history Buffet Crampon has developed the most complete range of clarinets, while always taking musicians', conductors', and composers' requirements into consideration. Developed in 1955 under the guidance of Robert Carre, the R13 clarinet quickly became the legendary choice of professional musicians. Musicians are charmed by the R13's rich and focused sound, its power in all registers and its flexibility. 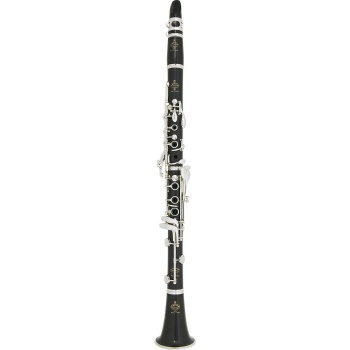 The Buffet R13 Clarinet is suitable for all types of musicians: symphony or chamber music, soloists, teachers, those in marching bands, students and amateurs.Most clarinetists purchasing an instrument with this level of distinction have particular preferences in terms of mouthpieces, so the Tosca Bb Clarinet is priced and shipped without one. A fine quality French-made HB ligature is included. The HB is a silver-plated metal ligature that is very easy-blowing and provides a round, centered and brilliant sound as well as a superior detache in the upper register. NOTE: Buffet does not include a mouthpiece with this instrument.